By now many of you have had the opportunity to digest Virginia Governor Robert McDonnell’s proclamation designating April as Civil War History in Virginia Month. I wanted to take a few minutes to share a few thoughts. First, perhaps I am guilty of criticizing the governor prematurely, but my remarks reflected an eagerness to see him follow up on what I thought was a very thoughtful speech at Norfolk State. I don’t know much of anything about the team that advised the governor on the proclamation’s content, but it looks like Ervin Jordan played a role. Overall, I couldn’t be more pleased with this proclamation. We are Americans remembering the war in Virginia rather than Virginians engaged in an imaginative process of remembering a war against the federal government in 1861. 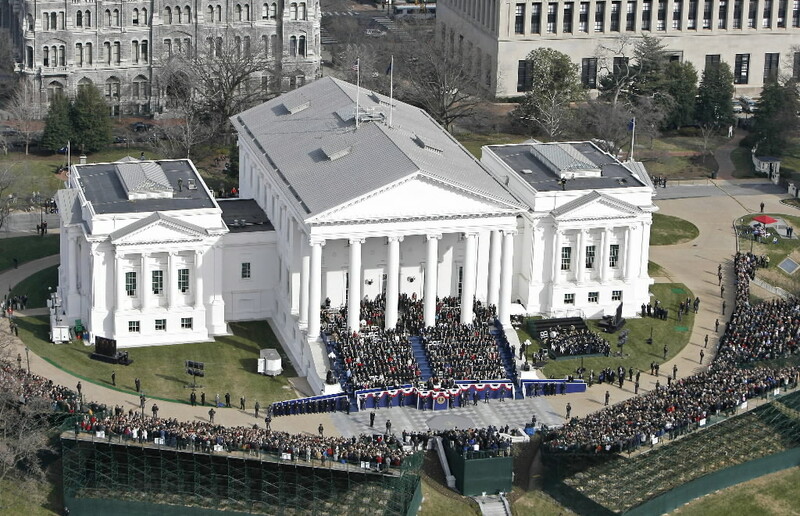 Now I understand that not everyone will agree with such a move, but I am convinced that they are a vocal minority in Virginia and throughout the country. The governor’s words also invite us to situate the war in Virginia within that broader vision that we all share, which we inherit from our founding documents. And, yes, it seems to imply that Confederate defeat was a good thing. While the tactics of Jackson, Lee, and Thomas are worthy of close study, it is the bravery of a former slave turned United States soldier that is presented as an exemplar of courage and sacrifice. Not only are we being asked to remember Carney as both a Virginian and as an American., but we are forced to confront the tragic story of slavery and the ultimate triumph of emancipation. Finally, Virginians are asked to think about the long-term consequences of war through the eyes of someone familiar and new. While Lee privately remained disillusioned by the outcome of the war and the end of slavery he did encourage his fellow Virginians to move on and embrace reconciliation. At the same time, however, the inclusion of Keckley reminds us of the struggles that African Americans would continue to face for the next 100 years. McDonnell’s proclamation fits perfectly alongside the work of the Virginia Sesquicentennial Commission, which itself was a creation of the state legislature. Given its origin it would seem only natural for the governor’s words to compliment the mission of this commission, which is something I have called for from the beginning. I hear you, Jimmy, but think about the fact that the acknowledgment of these men in the proclamation highlights a subject area that still goes unnoticed by many. Kevin-In my former life as an attorney with a smallish state agency, I often had to do first drafts and/or editing of documents, especialy personnel related ones, for higher-ups, which is an interesting, demanding, and sometimes contentious process. At least in my agency, it was a very interactive process, especially with the person whose name would go on it. In doing this kind of work, the first rule is to NEVER forget whose name is going on the document; essentially, one is channeling that person and writing what they would write if they had the time to do so along with providing one’s advice and research. The more sensitive the document, the more people review it and the more drafts it goes through (it means that each draft had to carry sufficient identification to show where it fit in the process.) I can’t even imagine the amount of review and revisions the Governor’s Proclamation went through, given the knowledge that every word would be scrutinized. It’s not a matter of having the avoidance of controversy as a goal. In cases like this proclamation, there is no way that one is going to make everyone happy and it’s virtually a certainty that it’s going to make a significant number of people very angry. It’s a matter of being very precise in what it is said so that one can support it and, if necessary, defend it, with confidence. In this case, in particular, I’m assuming they were willing to take some heat for a delay in issuance (and that, too, is inevitable and understandable) than put out something that they weren’t 200 % (no, that’s not a typo) satisfied with. I have no doubt that what you described reflects the care that went into this proclamation. It speaks well to the folks that he surrounded himself with for this specific announcement. It probably also speaks to the lessons learned from last years’ proclamation, which I strongly suspect did NOT receive such due reflection and careful vetting. Another Governor that does not have a clue about Confederate History and Heritage and he proved it with this proclamation. It is long past time when a Governor of Virginia should be required to be Virginia born and have to pass a politically uncorrect history class. Shame on Bob and priase to the 31,000 + Virginia soldiers that died during the War. Virginia asked these men to fight and they did with the greatest of HONOR. If this is they way Virginia treats it’s heroes no one should ever have any loyalty to this State or its leaders. Thanks for taking the time to comment. At some point perhaps you can share what problems you have specifically with the proclamation. Is there a specific sentence that troubles you or is it the overall focus? The Emancipation Proclamation and the ‘Civil War’ did NOT end slavery’s evil stain on anything – it was the 2nd version of the 13th Amendment (1st was Corwin) that stopped it – in Dec 65. It seems to me that there is a causal connection between the Emancipation Proclamation and the 13th Amendment, which is usually considered to be part of the Civil War. I am not sure what point you are making. I like this proclamation, but it omits a major experience of Virginia in the Civil War: the splitting off of 1/3rd of its counties and population to form the State of West Virginia. How would you suggest to include it? Whereas the long debate over secession led to one of the most unique events of the Civil War and in the state’s history: the tortuous separation of one-third of the Commonwealth into West Virginia. Many in the former northwestern section of the state wished to remain loyal to the Union while the rest favored secession. The combination of Union troops, the formation of a loyal state government in exile, and the assistance of the Federal Government, permanently divided the Commonwealth that once stretched from the Atlantic Ocean to the Ohio River. The genesis of the new state, whose legality remains a sensitive issue, further divided Virginians during the war and into Reconstruction. Interesting in that Ole Abe didn’t recognize the CSA as a seperate country, and when allowing WV to become a state, he willfully violated the US Constitution. Also ironically he allowed it in as a slave state. When the officials of Virginia violated their oaths to support the US Constitution by joining in the rebellion, they ceased to have any claim to be the government of the state within the Union. A loyal state government was recognized by the US government. It was that loyal Virginia government that gave the Constitutionally required assent to the creation of West Virginia . >>1862. On January 27, Ohio County minister and convention delegate Gordon Battelle proposed that the new state constitution provide for the gradual abolition of slavery rather than the immediate abolition he had proposed on 2 December 1861. This version of the proposal became the basis of the Willey Amendment. Source: Rice, West Virginia: A History, 145. The "gradual" abolition of slavery in West Virginia turned out to be anything but gradual. Slavery was abolished in West Virginia pursuant to legislation signed by the Governor on February 3, 1865 BEFORE the 13th Amendment was ratified. In 1862, the Lincoln administration was still trying to persuade loyal slave states to end slavery, including gradually, with federal financial support. Abolition by state law would not require a constitutional amendment. When those efforts proved futile, the provisional and final EPs were issued followed by the eventually successful efforts to amend the Constitution to abolish slavery immediately and without compensation throughout the US, including in the loyal slave states. I like your idea, but the separation of West Virginia from Virginia is too complex to summarize in a few sentences. Still, I’ve always been amazed that people who find the creation of West Virginia to be ‘unconstitutional’ or ‘illegal’ can find the secession of the Commonwealth of Virginia from the Union to be ‘constitutional.’ You are correct that the northwestern counties led the way in the call for the creation of a new state, but the residents of those counties were not the only citizens who supported statehood. The enlistment statistics for West (or Western) Virginia bear this out: approx. 40,000 men from the Mountain State fought for the Union or the Confederacy, with about 20,000 on each side. (This does not include an additional 12,000 Pennsylvanians and Ohioans who served in Union West Virginia regiments.) If there ever was a case for ‘brother vs. brother,’ it certainly can be found in West Virginia, probably more so than in Missouri, Kentucky or Maryland. These are the same folks who argue that Northern military activities constituted an “unconstitutional invasion” of a state, while at the same time claiming the Confederacy to have been a separate nation. A hundred fifty years ago, these same folks’ great-great-granddaddies — and mine — thought state’s rights and nullification was an inherent and inalienable right, except when states like New York exercised their state’s rights to nullify things like the Fugitive Slave Act. Cirque de Soleil’s got nothin’ on these contortionists. I agree that my suggestion lacks a great deal, but I intended it to be more in the spirit of the Governor’s proclamation. That document sought to remind people of certain historical facts pertaining to Virginia’s Civil War. Truly, a few sentences cannot do the separation of WV justice, but that’s all that the format allows. Perhaps I should change the word “legality” to “happenstance” in order to be more diplomatic. Thanks for the comment. Unfortunately, I have no idea what exactly you are responding to or what point you are trying to make. You seem to have a great deal of passion for something, but you don’t even have courage to post under your own name. Who is insulting who? Mr. Hall you say that you are AMAZED that those who know that Va’s secession was legal and yet say that the creation of West Virginia was illegal. It is really quite simple. Virginia was and is a SOVEREIGN State. The western counties of VA have no sovereignty without the whole. Actually, CB, I’m the scalawag who said that, not Andy. BTW, when my son was a knob, a black cadet won the “Star of the West” award. Talk about irony . . . .
Is there a good reason why you hide behind a pseudonymn? Mr. Snell old habits die hard! When I was an Officer I never posted anything using my name. I think the reason for that is quite obvious. It’s impressive for any Knob to win the Star of the West medal! It’s really neat that it contains wood from the vessel that the South Carolina Corps of Cadets forced to fly ingloriously out of the harbor. KP, you wrote that the Star of the West was ” . . . the vessel that the South Carolina Corps of Cadets forced to fly ingloriously out of the harbor.” I’ve never understood how the Citadel can make hay out of firing on an unarmed merchant ship. So to write that the Star of the West flew “ingloriously” out of the harbor seems to be a bit of hyperbole. (However, the exploits of the VMI Cadet Corps at New Market is the stuff from which legend is made.) Nonetheless, we’ve gone off-thread. If you’d like to return to the issue of West Virginia’s constitutionality, I’d be glad to resume the debate. First, however, you should read Margaret Blough’s thoughtful response from a few days ago. Mr. Snell…..you fail to mention that the Star of the West contained 200 US Army Regulars whose mission it was to reinforce Ft. Sumter. VMI at New Market is exactly what you said. A legend. So was the South Carolina Corps of Cadets at the Battle of Tullifinny which is one of the 9 Battle Streamers from The Late Unpleasantness that adorn the Flag of the South Carolina Corps of Cadets. I would LOVE to return to the debate about Virginia illegally having her western counties ripped from her. Bus as I settled that debate once and for all times above I don’t see where it would be productive. Ms. Blough is mistaken. It was, and is, the position of the national government that the States never left the late union. The proclamations of the ‘diseffected citizens’ and any illegally formed ‘rump regime’ hold as much power in law as Missouri, or Maryland, and Kentucky’s Confederate Governments in the eyes of unionists. Consistency in our views must be honored. Not only when it is to the benefit of those who were in arms against that most ancient of American Rights, self government, must they have been true. KP: People might take you seriously if your tone wasn’t so bellicose. You might think it’s funny when you use terms like “The Late Unpleasantness,” but those of us who read this blog (and history in general) have heard that one before, along with many other cute terms for the Civil War. I didn’t mention the 200 Regulars on the Star of the West because their presence within the walls of the fort would have been irrelevant. There wasn’t enough ordnance in that fort to make a difference anyway, so 200 more mouths to feed would have created even bigger problems for Major Anderson. As for West Virginia, since you “settled that debate once and for all times” there’s no need for further discussion. Today marks the 146th anniversary of the death of Abraham Lincoln, so I suspect you and the Kennedy brothers might be celebrating. Have a nice day. The shots fired by the madman Booth were the worst ever fired as far as far as the South is concerned. It put the traitor Andrew Johnson in the oval office and the retribution, corruption, and occupation began. I think Mr. Lincoln would have done exactly what he advised Genl Grant to do if Lee asked for terms “let them up easy”. I am no friend of the kennedy brothers. I didn’t need to read their book to know that we were right. It is as plain as day in the Constitution and the Dec of Independence. Lincoln said so himself in 1848. Respectfully, I think “the madman Booth” lets him off too easy, as though he were a mere lunatic no one could have stopped, no on could have prevented, and no one could have predicted. Booth was not a random nutcase, acting on the spur of the moment at the behest of voices in his head. While the actor was undoubtedly unhinged and irrational on some levels, he didn’t meet the criminal justice system’s definition of insane, then or (probably) now. He plotted in considerable detail. He successfully organized a crew — misfits and hangers-on though they were — and held them together for an extended period. He pulled together complex plans for kidnapping and then murder, then while implausible in retrospect, were nonetheless not entirely fanciful. He convinced two other men to commit murder as well, though one lost his nerve at the last moment. He had an extended network of sympathizers and supporters who, if not actively involved in the assassination plot, certainly did nothing to impede him. Above all, he genuinely believed that his actions were directly supporting the Confederate cause, or (after Appomattox) exacting its revenge, and expected to go down in history as a great Southern hero. Sadly for our country, South and North alike, some people still see him that way.